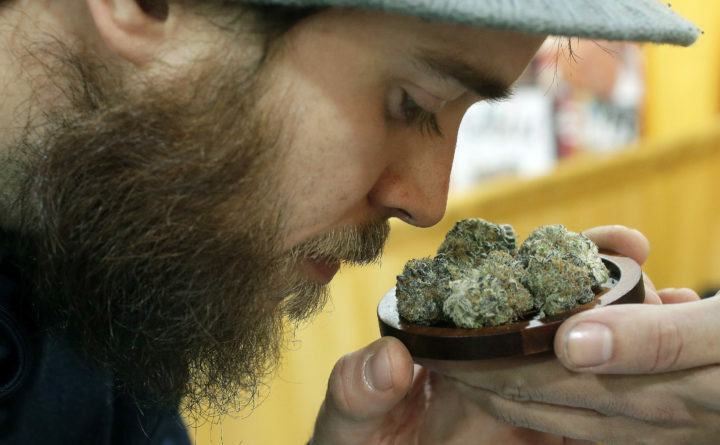 Julian Clark, of Westerly, Rhode Island, smells a strain of marijuana flowers called "Cookie Pebbles," at a trade show in Worcester, Massachusetts, Dec. 17, 2017. Consultants hoping to advise Maine on recreational marijuana sales have extra time to apply. The deadline is Thursday for those applying to guide state agencies as they craft adult-use marijuana regulations and review Maine’s medical marijuana program. Adults over 21 can possess up to 2.5 ounces of marijuana. But lawmakers delayed sales, which won’t become legal until agencies pass regulations and get legislative approval. Then, the department would complete regulations by April 30.